It's a sign of where we've come to that release notes from breweries can include phrases such as "approx 2 passionfruit per can" and it seems perfectly normal. 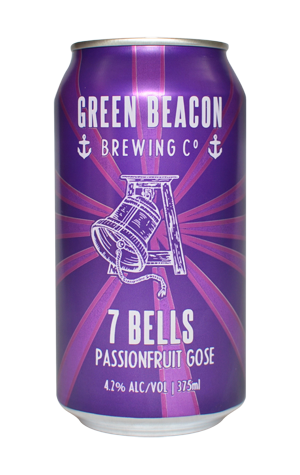 In the case of Green Beacon's 7 Bells, a beer that's been seen for some time on tap and has now graduated into tinnies, the fruit comes accompanied by Himalayan pink salt and lactobacillus, making it very much a beer for today. It's also very much a beer for summer, joining the brewery's excellent Wayfarer in bringing refreshment in spades. Indeed, if you're someone who's made peace with acidic tang in your beers then this will likely replace the Wayfarer as Green Beacon beer of choice when you're after something to quench a thirst in a hurry. 7 Bells is in a hurry to deliver that slightly sour tang too – no one's going to be complaining that they've reined in the kettle soured elements here – with the passionfruit and a balancing sweetness completing the picture in a beer that comes with the Brisbane brewery's now trademark poise; so well judged, in fact, you might mistake it for a soft drink – and not just for its very purple cans.